I am returning to a common blog post theme here and that is Google. More specifically here; "Google Search" and how their more and more spammy search results are now allowing "black hat SEO" tricks spam their algorithm. Participating in this ruse is DMOZ (the Open Directory Project). This website is nothing more than Adsense bait website with non-information that has NO REAL information about this subject. The so called "information" found there in has no real value, basically it is smarmy 1 or 2 sentence information one might expect from a child who is doing cut and paste homework. Even then what little "meat" found in this article is very outdated. So basically reading this article is like a journey back to the 1990's reading a brief middle school kids one day homework about the subject of "aquarium lighting"
This same website is practicing "black hat SEO" by having multiple website domains (URLs) with the SAME exact content! 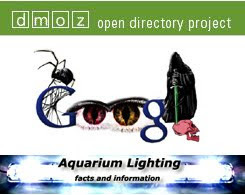 Sadly DMOZ has never allowed good content websites such as "Aquarium Lighting; Information" or "Aquarium Answers" into their directory after 8 years of requests for these and other quality aquarium/pond websites based on decades of experience and 1000s of hours of research. As well, dishonest websites/forums such as "SEO Chat" will defend DMOZ with vile "straw man" arguments and personal attacks. In summary, it amazes me that Google Search, as well as DMOZ have ANY credibility whatsoever!! But then when has the news media EVER performed ANY responsible journalism about their "darlings" and Google is certainly one of their "darlings". Before I single out the left-wing dishonest news media for irresponsibility in reporting Google's dishonesty in Search, Adsense, Plagiarism and more; I also have to call out Rush Limbaugh (whom I otherwise generally respect) for his constant use of the term "Googled". How is integrity EVER GOING TO WIN OUT???? ?